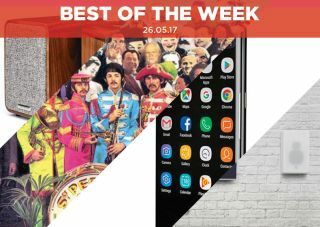 Best of the Week: Samsung Galaxy S8, new ATC speakers, Bank Holiday deals and more | What Hi-Fi? This week Dali made moves to develop a new multi-room system, Bang & Olufsen branched out into beer-making and ATC revealed a new range of vertical/horizontal wall-mounting speakers. For reviews, we have Samsung's Galaxy S8 smartphone. Ruark Audio's MR1 Mk2 wireless speaker and Bose's QuietControl 30 noise-cancelling in-ears. After making a splash with its Katch and Kubik Free wireless speakers, Dali is moving into the multi-room market. There are few details, however the Danish company confirmed it is working on a new wireless speaker solution that will use Lenbrook International's BluOS, a hi-res multi-room platform. BluOS is brand-agnostic, so any BluOS compatible device can connect to the same wi-fi network. It also forms the core of Bluesound's Award-winning multi-room speakers. In a curious use of resources, Bang & Olufsen has branched out into brewing its own brand of beer, called Beobrew. And how does it do this? Well, in true hi-fi tradition, it takes a BeoPlay A1 speaker, drops it into a fermenting tank and plays music throughout the two-week conditioning process. If you're in the UK and tempted by the sound of Beobrew, you can have some delivered to your home via B&O's website. ATC has remodelled its SCM7, SCM40 and SCM11 speakers and turned them into wall-hung units. They make up the first of ATC's range of high-performance on-wall speakers for the custom residential market. They come in three sizes and two different configurations: horizontally (HTS7C, HTS11 and HTS40) or vertically (HTS7, HTS11 and HTS40), and will be available in July. Are these the Star Wars gifts you're looking for? "The Galaxy S8 is just the response Samsung was looking to deliver to its critics"
After the widely-reported debacle of its Note 7, Samsung needed a win - and it has delivered one in the S8. Stunning build and design mark this out as a beautiful phone, but it has smarts too. Performance is snappy, the camera is excellent and the sound is decent, though it could be improved. However there are a few niggles. The Bixby voice assistant isn't yet ready and the fingerprint scanner is poorly positioned, causing a number of accidental swipes. Nonetheless this is Samsung back on top form, with a phone that demands attention. "The Ruark MR1 Mk2s manage to be even more appealing than before"
Ruark's MR1 were cracking desktop speakers in 2013, but they have since been surpassed. Can the Mk2s return to the top? The Mk2s continue the good work of the MR1s, offering a step up in performance with a stunningly musical sound. There's no support for hi-res or inclusion of a USB port. Still, these are superb speakers and a new favourite of ours. "It’s another five-star pair of chart-topping headphones from Bose"
An in-ear that also does noise-cancelling? Bose's QuietControl 30 sport an odd design, the headphones are attached to a plastic collar that hangs around the neck. It's durable enough, but not the most comfortable of fits. Nevertheless, it's the sound we're interested in - and it's impressively spacious. Insightful, but also capable of delivering some punchy bass. The noise-cancelling works to a tee, eliminating noises in an effective manner. The design may grate, but we have no quibbles with the performance. Another five stars for Bose.